"Mr. Bond, they have a saying in Chicago. 'Once is happenstance. Twice is coincidence. Three times is enemy action.'" And so it proved yesterday, as the intrepid bond sellers following the weak ISM and payroll data would have done well to heed Auric Goldfinger's warning. As it was, the bond and currency markets concluded that yesterday's appalling services ISM was indeed enemy action and beat a hasty retreat to the exits. Five year yields notched their biggest yield decline since the immediate aftermath of the Brexit vote, while the EDZ6/Z8 spread is now back towards its tights, pricing LIBOR just 25 bps higher over the two years covered by the spread. And really, it's hard to blame them. In the nearly 20 years since the launch of the non-manufacturing ISM, the weighted composite measure has only been lower during the two recessions of the last decade and during the March 2003 invasion of Iraq. Needless to say, the GDP growth forecast implicit in the current reading is very dismal indeed. In one way, however, the decline in fixed income yields was something of an anomaly. After all, that's what is "supposed" to happen. 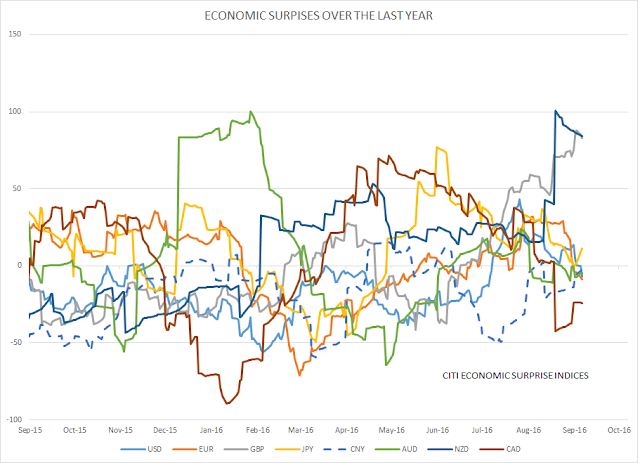 For much of this year, the relationship between economic surprise and yields has been tenuous at best. 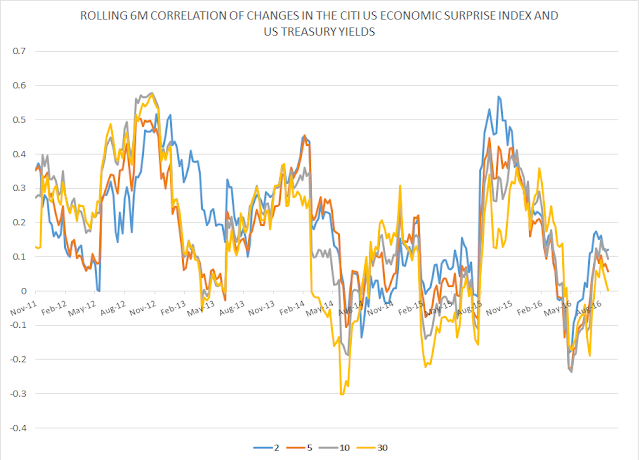 The chart below plots the rolling 6 month correlation between changes in the Citi US economic surprise index and Treasury yields of various tenors. Note that the calculation is done on weekly data to smooth out some of the noise. As you can see, over the last six months there has been precisely zero correlation between long bond yields and economic surprise. Small wonder that global macro strategies are struggling! More generally, a scan of economic surprises reveals little to get excited about, with two notable exceptions. With an irony so delicious that it's just been awarded a Michelin star, those two stalwarts just happen to be home to two of the most hated currencies of the past few months: the UK and New Zealand. The failure of the hard data in the UK to conform to the post-Brexit dip in sentiment has confounded many expectations, including those of your author. Suffice to say that he's been out of his sterling short for quite a while now and he's rather happy that way. As for the kiwi, the skyrocketing of the NZ surprise index is quite possibly the "missing link" to explain recent NZD outperformance. When Macro Man bought AUD/NZD the other week, he was under no illusions that he was buying the ding-dong lows, and sized accordingly. It may well be the case that either Aussie data needs to surpass expectations or that the trend in its neighbour tails off for the trade to work. Either way, Macro Man can be patient- a requisite with a trade like Aussie/Kiwi. Squaring the circle, Fleming's prophetic quote at the top of today's post serves as a timely reminder of how difficult it is to get the better of Mr. Bond these days. Outside of what Yellen and co. are doing, the global trend towards low yields remains a strong one; can you believe that 5 year German yields are now -0.55%? It's hard to see any value whatsoever there, but with Draghi on Thursday can you blame the market for not wanting to be short? Somehow it feels like Hollywood should re-make Goldfinger to account for the new ZIRP/NIRP reality. (Fun fact: in the novel, Goldfinger keeps a portion of cash holdings in Venezuelan bolivars, which at the time was one of the world's stronger currencies.) It would be hard to replicate Shirley Bassey's iconic theme tune, however. Perhaps they could get Justin Timberlake to record "It's My Franc in a Box" instead? Mr Macro Man, they have a saying at Royal Randwick"..." the B grass is for kids, the A grass is for the wannabes, and the course proper before sunlight is for those with clocks in their heads"
As what was a pretty lonely voice suggesting £ was overcrowded and buy rather than a sell back below 1.30 I would say right now don't get too excited about £ and it's fortunes. Just has the hedgies got over positioned about the UK's poor prospects so it's likely that people are misunderstanding the economic 'good' news. I mean come along now let's try to apply some of our business commonsense to what we are seeing. We're the director of our British business and way back at the start of the year we get told about a referendum. We back boiler what we can and wait for some clarification on the outcome. However, regardless of outcome we know life and business goes on so after the event we revisit our statis decisions and pull the trigger on what we are still comfortable with. This is like opening a dam sluice because aggregated business that's been deferred is suddenly now out there all at once. However, the flow is pretty much a one off effect and with each week that goes by it will ease back. That means pretty soon the people who misunderstood this effect and took it to be an all clear business as usual for the Uk are going to be as wong as the guys who got overpositioned expecting instant Armageddon. One would think that commonsense tells you that the UK's economic position post referendum is going to be muddy for quite some time. We've seen some cover buying and likely we can see more ,BUT this is very much trade ,take the money and run for £ long. I still wouldn't want to be short the £ ,but I'd want a reality check correction has part of a longer run basing action to be repositioned long. With mu investor hat on I wouldn't have been long £ here I'd have been waiting for the basing action to confirm itself. agree with you checkmate in as much that the easiest trade of the past few years has been to fade emotion. that is never more true than in FX because the leverage amplifies sentiment over fundamentals. I suspect the longer run fundamental economic impact of Brexit is virtually zero ,but that means currency repositioning is just poor interpretation of data and the effect mentioned in para 1. Looking back over the decades experience tells you don't position for continuance on an event that the market has been given time to anticipate. Probability is you're just another latecomer to used for covering. Checkmate - I concur 99%. The remaining 1% being that I would actually get short right around here. Technically, decent risk/reward with 1.35 as your stop and fade the whatever good news momentum it expects off of industrial production number. My belief is that Carney will be more gloomy than he is optimistic. I also think that all these one off positive data points so far have been essentially cycled through the market... now either an abrupt drop off in data or slow bleed lies ahead. Again, should I be wrong, given the technicals, its easy to know where you stand on the trade and one can exit with a minor scar. I've been an advocate of nzdusd and audusd longs for weeks if not months as an anon here. The 0,76/0,7750 zone should proove a very important one but we're not quite there yet. One or two weeks ago I said pound could be heading towards 1.36 based on the pattern post brexit, seems on it's way (1.3550/1.37 for a zone). I would expect decent dollar strenght when/if those price levels are reached. Checkmate, Pol, Fired etc are all correct. To quote Pol, "the easiest trade of the past few years has been to fade emotion". On this basis, I am still long equities, with a target of "infinity & beyond" (h/t Mr Lightyear). In my entire 12month professional career, I have never seen an asset class more hated by traders, and yet more supported by Central Banks. To put it another way, "stocks are lit!" I look forward to hearing Draghi tell us tomorrow that the ECB will buy equities directly with a view to increasing my P&L. Peace. I guess will all remember how a privately held company, Theranos, developed a blood-testing device named Edison and raised $400 million from investors, valuing the company at $9 billion. Speaking of patterns, VW on the weekly chart. Daimler(different pattern) also. Will wait for the Breakout. Germany sold €3.5bn 10y paper at record low yields of -0.11%. Made about€38.5m profit. Magic. This commentator with -EURGBP got stopped this morning. The more extended the move (this one had been 16 days running), the tighter the stop I use. Still see heavily short-GBP positioning (at least, looking a COT). I do wonder whether there's a trade in shorting gilts, perhaps against long treasuries. On some measures, gilts are expensive vs treasuries, supply will turn positive in Oct and Nov, and gilt yields/curve shape bottomed at a similar point after prior QE commencements (bumming this analysis off JPM, who just see gilts range trading from here, but seems an interesting setup to me). My thoughts on the intermediate and longer end (and probably everything, for that matter) are always too facile, so I'd be happy for anyone to educate me on why -G Z6 vs +TYZ6 is poison. most hated rally huh? you are kidding me son. Carney what can you say about his approach? His policy action made somethingelse much less likely to occur etc etc. The real problem I have with this kind of justification for action is obvious. How in heavens name can you ever know you have prevented something from happening IF it never happened? God I wish I could have got away with that in business over the years. Listen up, I've cured my neighbour of cancer. I know because he's not got it yet. Pay me. "About 2 months ago, the large cap U.S. stock indices finally managed to break out to new highs following more than a year of trying. After several days of follow through, the averages settled into a trading range. This was not an unexpected development, nor an unhealthy one. However, it would develop into an unusually tight trading range. And after a couple weeks, we began to publish some charts and posts detailing just how historically narrow the trading range had been. Well, we had hoped that each of the posts would be the last in reference to the range. However, we could not envision that some 30 days out, the averages would still be constrained to essentially the same tight range. Therefore, we make no apologies for (hopefully) just one more look at this historic range. In today’s Chart Of The Day, we note that, unbelievably, the high to low range in the Dow Jones Industrial Average (DJIA) over the past 40 days is a mere 2.27%. For context, that is the tightest 40-day range in at least the last 100 years. And in fact, the next tightest range – at 2.53%, occurring from December 1922 to February 1923 – is not really even close. " Check out SnP trading ranges (esp intraday lows) post 6/27- Tight AF. CBs clearly saying they will accommodate + unconventional measures and all we get is what BTFDers call "consolidation" for what shorts call "exhaustion." Carney is like a music hall clairvoyant. "I m getting a signal...mmmm... Is there .. is there .. a Dave in the house? There is? " brilliant .. "and has someone in your family, Dave, passed away over the past 70 years? they have?" genius .. "They are sending you a message Dave, Worship my brillance and tip me an extra fiver"
A quick question: if I want to bet that ECB under-delivers tomorrow and EU bond yields would rise, what is the best vehicle on the US market? Yes, Virginia, there is a correlation between the action of the ECB and the German DAX. Yes, I know MM disagrees, Virginia. I don't know what to say about that. Whilst on the subject of bonds, I'm interested in views on whether EM debt is simply overbought and will be crushed as and when US rates start to rise. Or whether the "shallow trajectory" of any such rises and the continuation of yield hunting will combine to mean that it is different this time..? I'm guessing most everyone on this board, aside from 12yoHFM, disagrees with me. 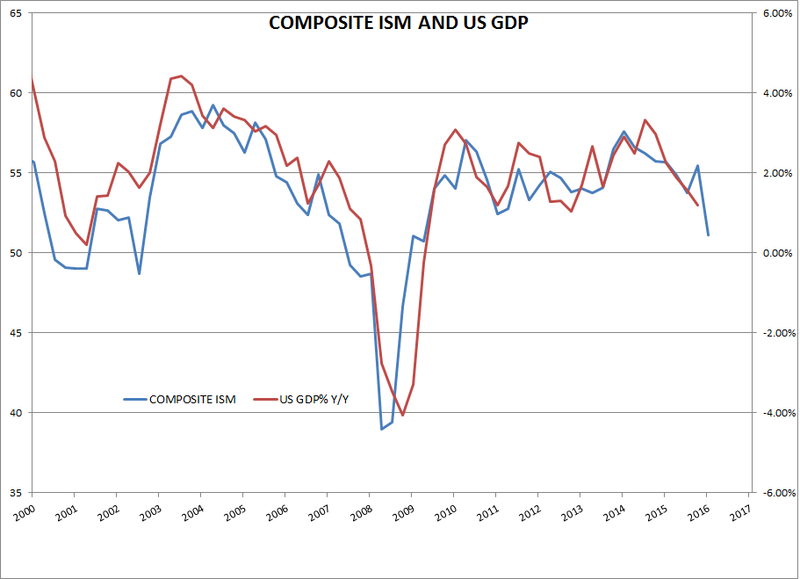 JP's Cembalest had some nice charts in a piece yesterday: Growth is turning up. EM reliance on foreign capital near cycle lows of the past 40 years (according to chart provided by Bridgewater). EM export growth stabilizing. Policy rates of capital-dependent EM central banks are very high and those countries have sizable output gaps which should bring down inflation. Separately, real rate spreads to DM are fairly high, looking back the past decade or so. Chinese H shares (via options). PPI deflation ending this year. Apparently government is also loosening policy for the second time this year, or so GS surmises from Li's recent remarks and inspectors being sent to harass local governments to complete projects. the market lower.... The low exposure of long-short hedge funds, and the fact that equity momentum would only turn fully negative below ~2000 on the S&P 500, are the only two positives we see for the market going into September." Hey Johno - Remember, i'm really long NZD here as well. For now, I'm pretty much flat (-0.11%) on spooz vs +1.2% for NZD, and I actually feel like I'm freerolling here in the face of "everything is great" narrative potentially turning here as we get closer to the Fed meeting. 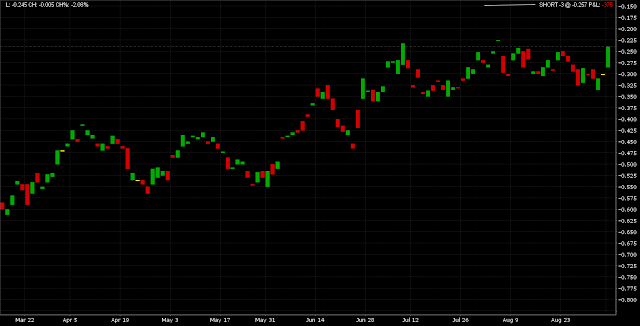 On the flipside, do you see US equities breaking out before Sept 21? If you were to handicap it, wouldnt you say the odds of a brief "scare" in risk higher in both pre/post sept 21 decision? I'm also not that involved at the moment - with roughly 60% of capital is sitting as cash waiting for a better trading climate. One other position I do have at the moment is a small rental in ishares EM local bond ETF - again highlighting my belief that September is a no-go. BUt thats about it.. just three positions, not too crazy. However a year like 2015, i'm not looking to score (let alone hope) +20% return. I'm pretty happy w/ 6-7.